Nokia has unveiled another budget smartphone. Named the Lumia 525, it's the follow-up to the Lumia 520, with improved specs but still a low, low price. Nokia's Lumia 525 is the company's latest wallet-friendly smartphone. And it could be the last handset Nokia ever announces, before it becomes part of Microsoft early next year. 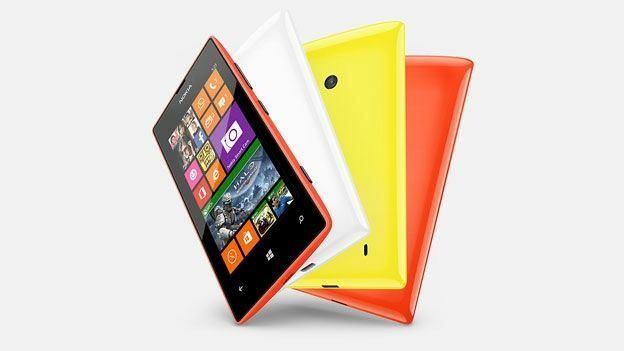 It features the same 4-inch screen as its predecessor, the Lumia 520. It has the same 800x480-pixel resolution, too, and inside is the same dual-core 1GHz Qualcomm Snapdragon S4 processor. The camera is the same 5 megapixels, and the handset has the 8GB of onboard storage.So what's changed from the Lumia 520? The 525 has double the RAM of the 520, at 1GB. It also comes with the Windows Phone Black update straight out of the box - this adds more live tiles to the home page, and runs faster than the standard Windows Phone OS. All the usual Nokia software comes as standard too, like Here Maps. The Lumia 525 comes with interchangeable glossy back covers. They come in three colours: orange, yellow, or white. Nokia announced the Lumia 525 in Singapore. There's no word if or when it'll come to the UK, but we'll bring you more news as we get it. If it does hit these shores, it'll be up against the Motorola Moto G, which costs just £135. On Monday, Nokia announced the Lumia 1520 will hit the shops a week on Friday. With a 6-inch screen, it's the biggest handset Nokia has ever made.